RICHMOND defender Dylan Grimes is expected to miss two matches with a "low hamstring" injury, with teammate Brett Deledio ruled out for another week with his quad issue. Grimes, who has a history of hamstring troubles, suffered the same injury against Adelaide in round 19 last season and missed two matches. The 24-year-old suffered the fresh setback in the first quarter of Friday night's clash against Collingwood and had scans at the weekend, which confirmed his third hamstring injury in 12 months. 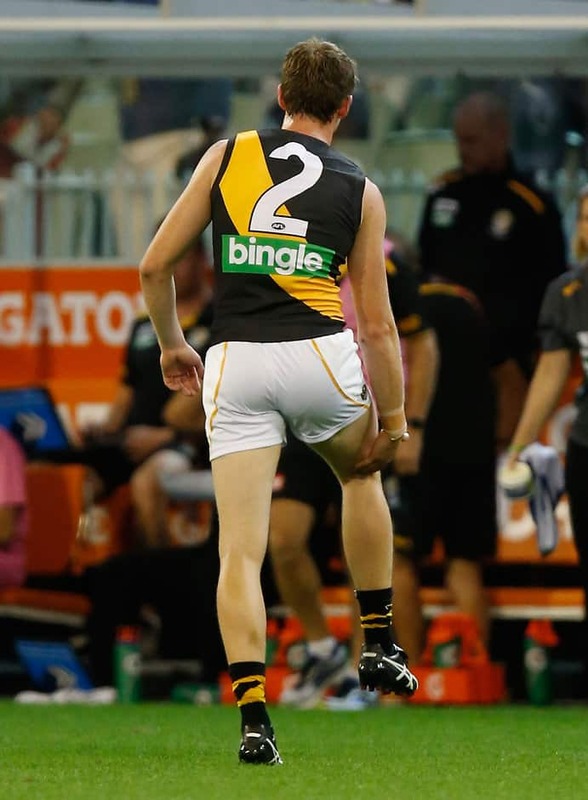 He joins fellow defenders Reece Conca (hamstring) and Chris Yarran (foot) on the sidelines as the Tigers prepare to face Adelaide at Etihad Stadium on Saturday. Half-forward Shane Edwards (hand) and ruckman Ivan Maric (back), will both be available for selection if they get through training this week. Richmond physical performance manager Peter Burge ruled a line through Deledio on Monday, telling the club's website "he won't be playing this week". Burge said the important half-forward had resumed short kicking, which would be built on over the next week. "I don't have a date and that's probably the most frustrating thing ... it will be ready when it's ready," Deledio told Channel Seven's Talking Footy. "I'm running full-speed, but I just can't kick at the moment. "I can kick a (short) distance, just not anything more than 20-30m, which is pretty important in our game." Burge said the setback suffered by Grimes was "an unusual and rare" injury, low on the defender's semitendinosus. "He did have this issue last year … and missed two games and we're anticipating it will be approximately the same," Burge said. Yarran remains up to six weeks away, but has started supported running on an anti-gravity treadmill and will progress to running on grass this week.